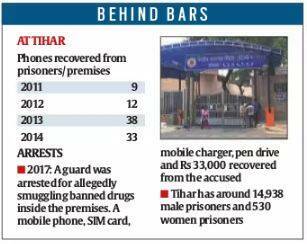 A draft proposal sent by Tihar Jail authorities to the Delhi government's Home Department has sought extension of the jail term of inmates by three years if electronic devices, including phones, are recovered from their possession. A draft proposal sent by Tihar Jail authorities to the Delhi government’s Home Department has sought extension of the jail term of inmates by three years if electronic devices, including phones, are recovered from their possession. “We have asked the home department to make an amendment in the law… We hope they accept it,” Additional IG Rajkumar, Tihar spokesperson, told The Indian Express. Officials said the recommendation was made after multiple inquiries showed that inmates have easy access to prohibited articles. “Inmates smuggle prohibited items through the entry lounge of jails by concealing them on their person or in body cavities… Sometimes our staff are found to be allegedly involved as well,” said a senior jail official. Currently, if any electronic device is recovered, authorities resort to simple punishments such as cutting food rations or stopping other services. Disciplinary proceedings and departmental action are also initiated against staff involved in wrongdoing. “In the absence of an appropriate law, such actions don’t have much effect… Jail authorities have also discussed the same in several meetings with legal experts,” the official added. The proposal also mentioned security measures to prevent such activities. “We have deployed Tamil Nadu Special Police personnel at the entry lounge of all jails for searching and frisking of prisoners, staff and visitors, and to check articles brought by them. We also conduct surprise searches of all barracks, cells and prisoners regularly. We have also installed door frame metal detectors, handheld metal detectors and X-Ray scanners at all access points and at the entry areas for proper screening,” an officer said. The jail administration is also planning to install high-end CCTVs at a cost of Rs 120 crore on the premises, as many don’t work properly and don’t cover the entire premises. “ We are also planning to upgrade the existing phone jammers to block 4G communications as well,” the official added.